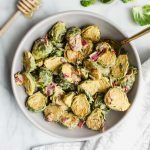 These Honey Dijon Glazed Brussel Sprouts are caramelized to perfection and coated in a tangy sweet sauce! 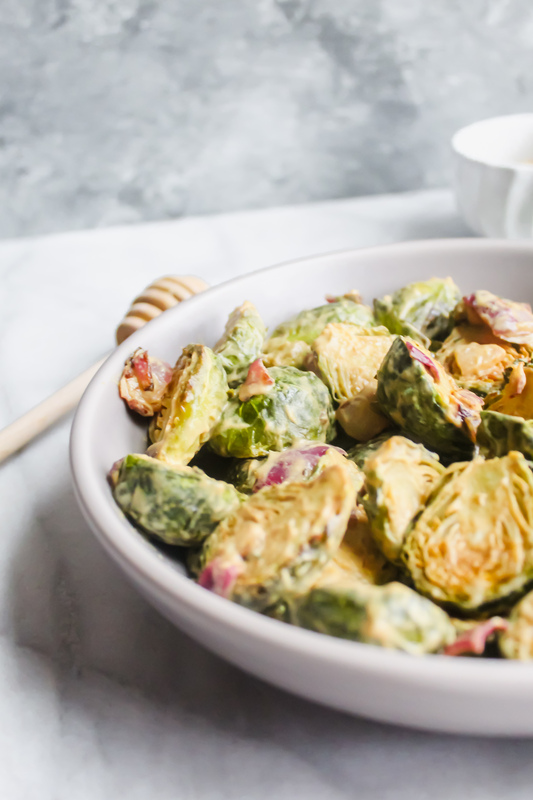 The perfect and easy side dish for any occasion! Okay, I’ll admit it. Brussel sprouts have always been one of those foods that you’re like mmmmm, no thanks. Like, since I was a kid. Wasn’t that always the ultimate form of punishment? BRUSSEL SPROUTS FOR DINNER? Why, Mom, why?! So, in my very biased and stubborn mind, I was never gonna like those little green guys. Until one day, I decided to be a grown up and just try them out again. Give ’em one more shot before I wrote them off forever. And guys, the result? DELICIOUS! Wowza have my tastebuds been missing out for all these years. 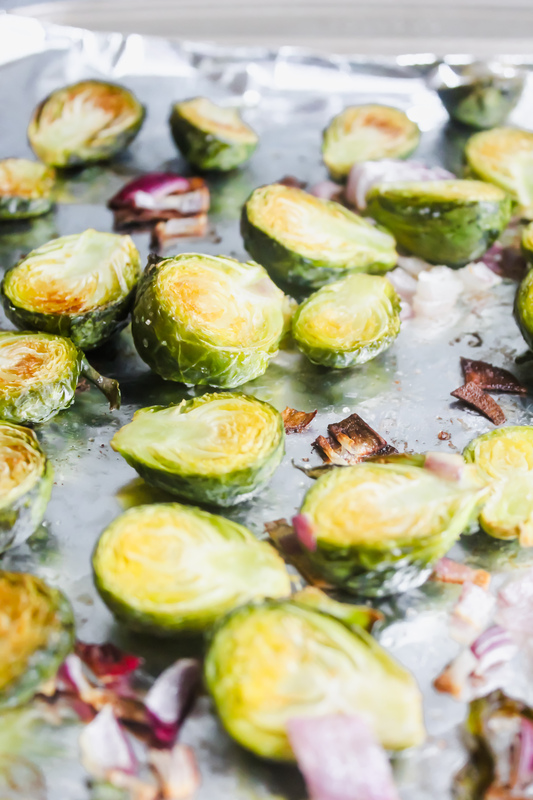 Roasted caramelized brussel sprouts, juicy yet crunchy, sweet red onion – all topped with olive oil, salt and pepper. Oh, and did I mention they’re coated in a delicious homemade honey dijon glaze that puts the cherry on top. 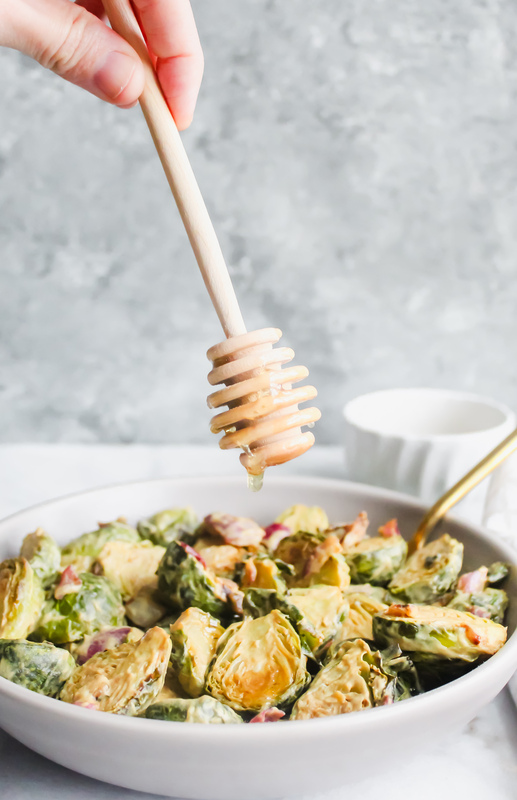 This is the perfect side dish – it’s SO EASY! You basically just plop everything onto a baking sheet (pro tip: if you use aluminum foil to coat your baking sheet – no clean up for you!) and then you roast them. That’s it. You set a timer on your phone, you scroll through social media and wonder where that girl got her cute shirt, flip the sprouts a couple of times and before you know it, BOOM. They’re done. Once they’re done, all you do is place them in a large bowl and add that delicious golden sauce you see above. Mix to combine and you’re set! 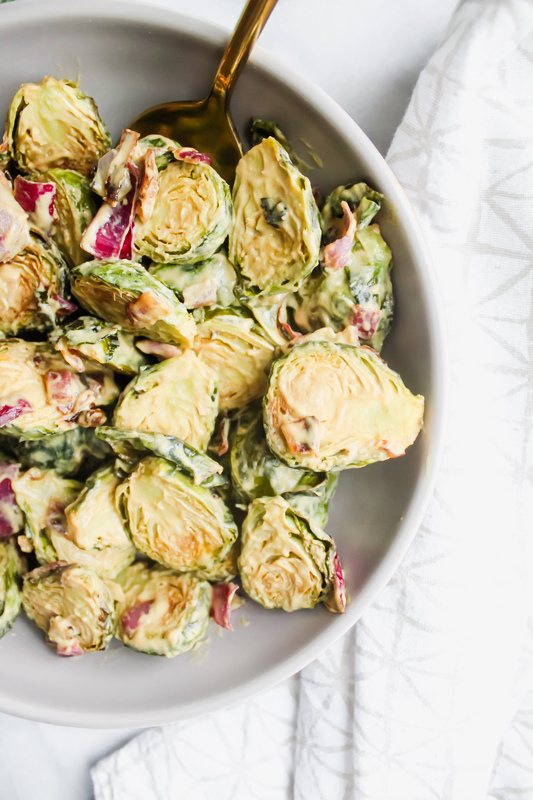 The brussel sprouts are crunchy, slightly juicy perfectly roasted. I love the crunchy and slightly spicy red onion and the zippy honey dijon glaze which is the perfect mixture of sweet and savory. It’s basically like Fall in a bowl. Definitely give this recipe a go even if you’re a former brussel hater – it may just end up changing your mind! Be sure to follow ourbalancedbowl on Instagram and tag me with your photo! You can also post a photo of your recipe to theOur Balanced Bowl Facebook page! I always love to see your re-creations! If you do make it, be sure to rate and comment so I can get your feedback! Xo! 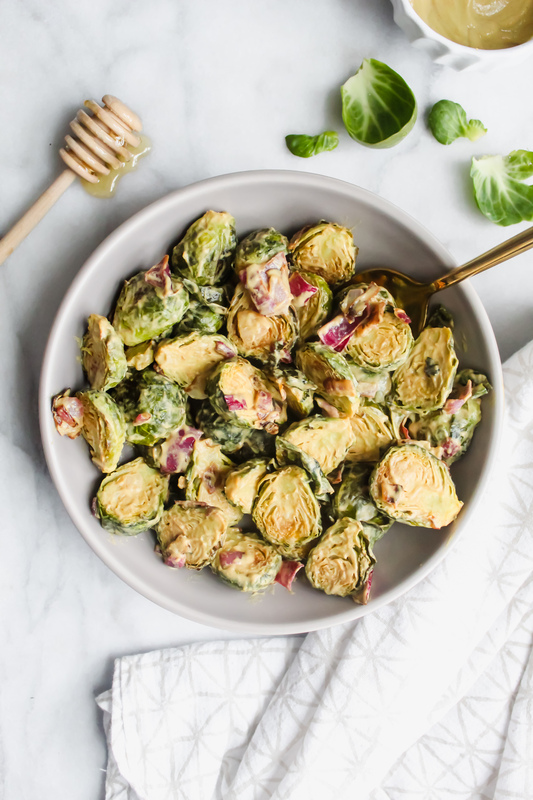 A delicious side dish filled with caramelized brussel sprouts, red onion and a sweet tangy glaze to finish. Preheat oven to 400 degrees. Coat baking sheet with aluminum foil. Cut brussel sprouts in half. Chop 1/2 of a red onion into chunks. Place prepared vegetables into a bowl and add olive oil. Mix well to coat evenly. Evenly spread brussel sprouts and onion onto the baking sheet. Generously add salt and pepper to taste. Place in oven and roast for 25 minutes, turning the sprouts every 10 minutes. 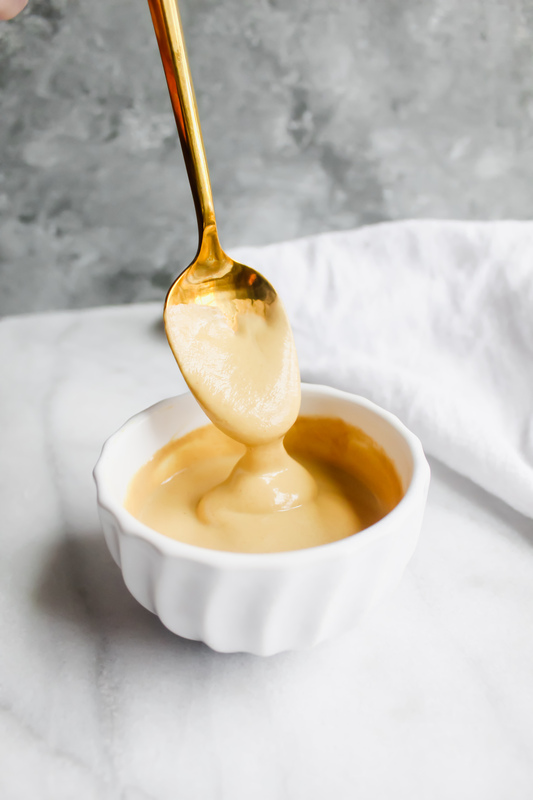 While those are baking, mix dijon mustard, balsamic vinegar and honey into a medium sized bowl. Once the brussel sprouts are roasted to caramelized perfection, transfer them to the bowl you just made the glaze in. Mix well to coat evenly. These would be a great side dish for Thanksgiving! I tried them for the very first time this summer…simply roasted with olive oil, salt and pepper and they were simply amazing!!! I made these for a Friendsgiving and for Thanksgiving with my family. They were a hit at both and my brother even asked for the recipe for a Friendsgiving he was attending. Delicious! Jeanette – that’s awesome to hear! So glad that you and your family enjoyed them!